Please understand your local gun regulations before ordering anything from this website. CAN I BUY A GUN? Metro DC's Best Gun Shop! 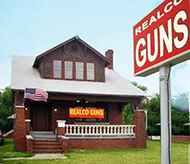 Realco Guns Inc. was established in 1970 by our founder, Greg Del Real. Today Realco Guns continues as a family business and is in it's second generation. Our commitment to excellence and to the Washington D.C. metro area firearms community is proved by our longevity. We believe that the right to bear arms is essential in maintaining the liberty of free men and women. Because oppression often follows the disempowerment of the individual, we are committed to promoting the second amendment as a crucial part of the U.S. constitution. Our staff draws from decades of extensive experience and personal interest in firearms. We come from military and technical backgrounds that complement our work on your behalf.The complexities of the Maryland and Washington D.C. procedures demand that the advice you are given is accurate and thorough. At Realco Guns we are happy to help with what can be a daunting purchase. We are expert at helping you find the right solution for your specific need. Whether you are a collector or a novice, a sport shooter, or interested in providing personal protection for your family, we can help. Realco Guns is your FULL-LINE gun store! More advanced shooters can take advantage of the hunting and military expertise available from our staff . We can identify, supply and install the premier optics and accessories that will improve your results. © 2015 Realco Guns. 6108 Marlboro Pike, District Heights, MD 20747. Phone: 301-736-9800 Fax: 301-736-7099. Email: info@realcoguns.com Hours: Mon – Fri 10 am - 7 pm, Sat 10 am - 6 pm.